Books Make Great Easter Basket Fillers! Stop Waiting Until Things Are Perfect! Do you find yourself waiting for conditions to be perfect? STOP, things will never be perfect. Start living the life you came to this planet to live TODAY! Do it now! No matter what else is going on, STOP, take a chance. You are here to shine your light! Allow it to happen! Be The Spirit of Christmas – Here On Earth! Do You Want To Get Unstuck In Your Life? 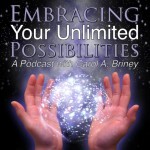 Carol A Briney Will Be Interviewed On The Empress Of Biz Radio Show!